Fun finds that'll make your space truly yours. 1. A bold throw blanket that'll make even a lazy night in your PJs feel a little festive. 2. A gorgeous wall tapestry perfect for anyone planning to study abroad...or anyone who appreciates far-off lands but would rather stay in the comfort of their own dorm room. Seeing the whole world for under $10? Yes, please! 3. A boho chic comforter and sham set I don't think I even have to try to tas-sell you on, the cuteness speaks for itself. Price: $39.96+ (available in a twin/twin XL size with one sham or full/queen size with two shams). 4. And a fab tasseled velvet throw pillow to go with it. 5. Peel-and-stick hearts that are easy to remove without leaving any residue, so when it's time to move out, you'll be golden. 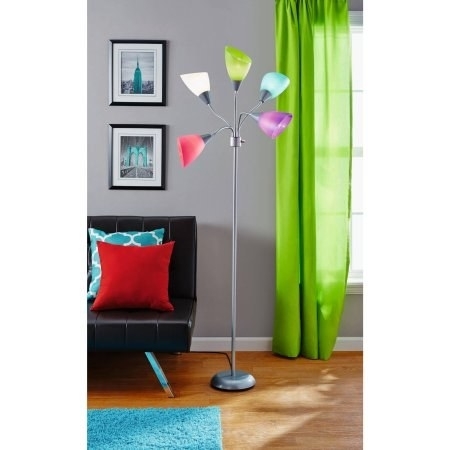 They'd also be great for spicing up super boring, standard-issue dorm furniture. 6. 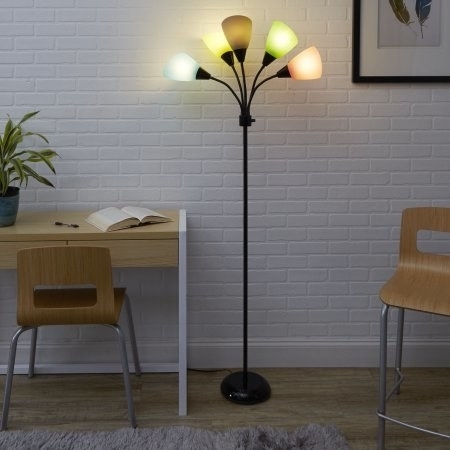 A sleek organizer lamp with a built-in outlet that's a truly bright idea. It can serve as a stand for multiple electronic devices like your phone and tablet and also features a shallow dish for desk odds and ends. Basically, no matter how small your dorm room desk is, this baby will help you fit all the essentials. 7. A vibrant over-the-the door mirror that opens to reveal jewelry storage. Talk about combining fashion and function. It comes with two hooks so you can hang it over your door without having to make a single dent in your dorm walls. 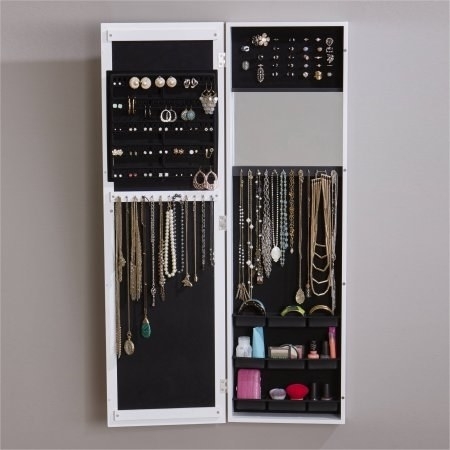 And it can handle even the most impressive of jewelry collections — the inside has three rows of storage trays, 24 hooks, holes for 50 pairs of earrings, and slots for up to 84 rings. 8. 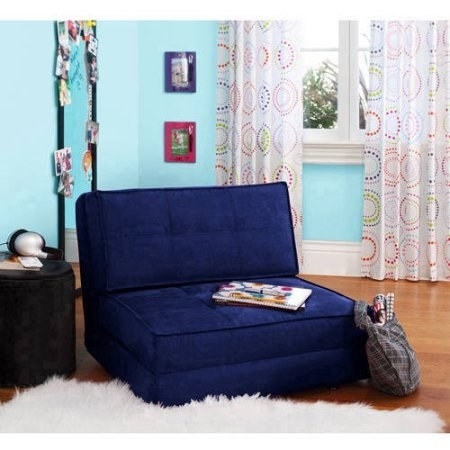 A funky and multipurpose storage ottoman that can seat your friends and hold your stuff. 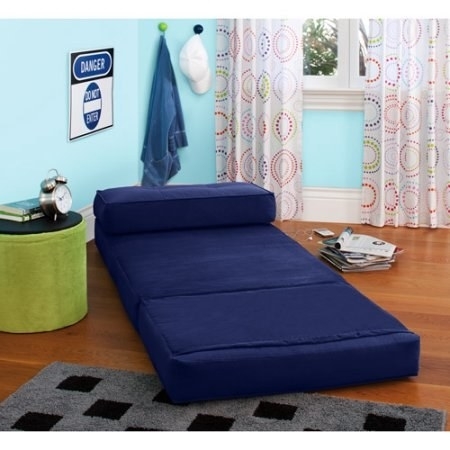 Plus, it's collapsible so you can tuck it away when not in use and maximize that precious dorm space. 9. A reversible sequin pillow that's so much fun to play with, you may need someone to remind you to stop and do other things like, you know, go to class. 10. 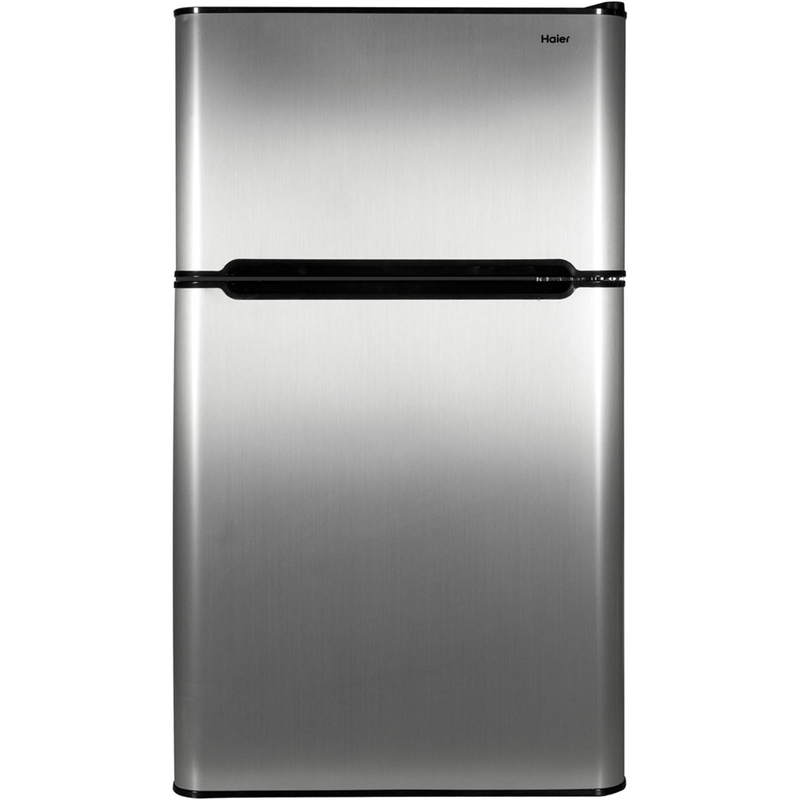 A sleek magnetic mini fridge all your friends can admire and enjoy when they come over to ~chill~. Because really, what would college be without snacks? 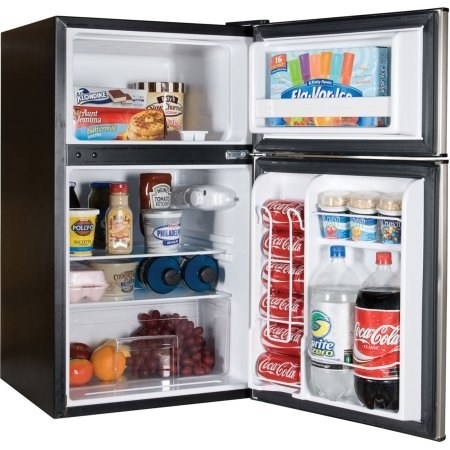 Oh, and it's got a freezer on top, so ice cream is definitely on the menu. 11. An adorable mini garden of faux-succulents, which provide all the fun of real plants without the responsibility. It's hard enough taking care of yourself, amirite? 12. Or, for a more glam take on the succulent trend, a golden cactus to have your desk lookin' ~sharp~. 13. A gloriously geeky Harry Potter Quidditch poster that's a real keeper. It measures 22.375" x 34", so it'll fill in that awkward bit of empty space next to your desk just like magic. 14. A knit throw trimmed with posh pom poms that'll be a total ball to curl up with. 15. A jewelry organizer featuring frisky felines who you can trust not to lose your favorite baubles in the crevices of your tiny dresser. 16. 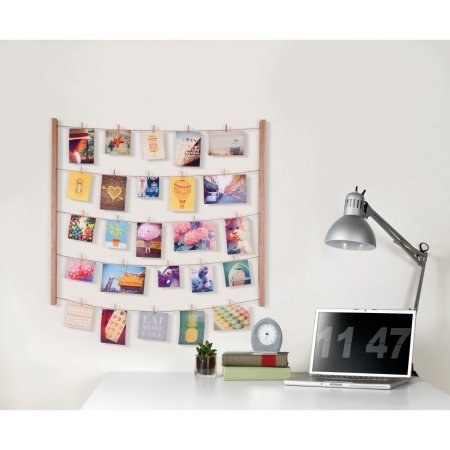 A wood and string photo rack for a fresh, artsy way to display your fave pics. 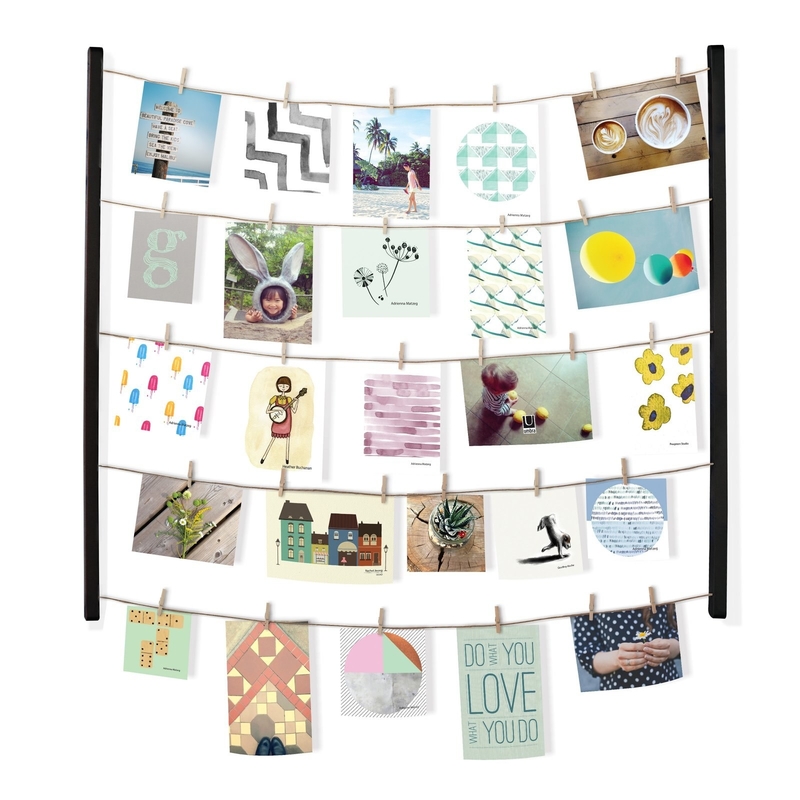 It comes with 40 clips so you can start hanging all your fab photos right away. 17. A chair-shaped bean bag with a bit more structure than your average bean bag, because this is college and you're an adult now. It's still just as fun to squish, though, don't worry. 18. A boho-printed elephant tapestry for a fabulous accent visitors will never forget. 19. A mod area rug to cover up that bland (and kinda gross, tbh) dorm carpet. 20. A personal throw pillow to make every day a red (or rather, gold) letter day. 21. A coated wooden trunk that's a stylish way to stash your stuff when you're staying put, but also has wheels to make move-in day less of a struggle. 22. A peel-and-stick collage of fabulous destinations from around the world, for anyone who's heart belongs to far-off lands. 23. A five-light floor lamp with flexible necks so you won't have to squint to see your assignments, no matter where you're sitting. 24. A laundry hamper with handy handles and a mesh top so you won't risk spilling your undergarments all over the stairs when you have to schlep down to the washing machines. The funky pattern means it'll look cute in the corner of your room when it's not laundry day, too. 25. A faux-suede chair that can flip out into a bed and is exactly what your common room (if you're lucky enough to have one) needs. It's perfect for when friends visit (or need to escape from their roommate for a night). 26. Floral darkening curtains to give you some privacy and block out the evil sun that wants to ruin your Saturday sleep-in. 27. A zigzag wastebasket that'll be handy to have by your desk throughout all the ups and downs of college. 28. Colorful symbol bookends to add a little pizzazz to your giant stack of textbooks. 29. And a Himalayan salt lamp with a soothing glow to help you relax, no matter how salty you are after a long day. It's made from natural Himalayan salt, which is thought to act as an air purifier.